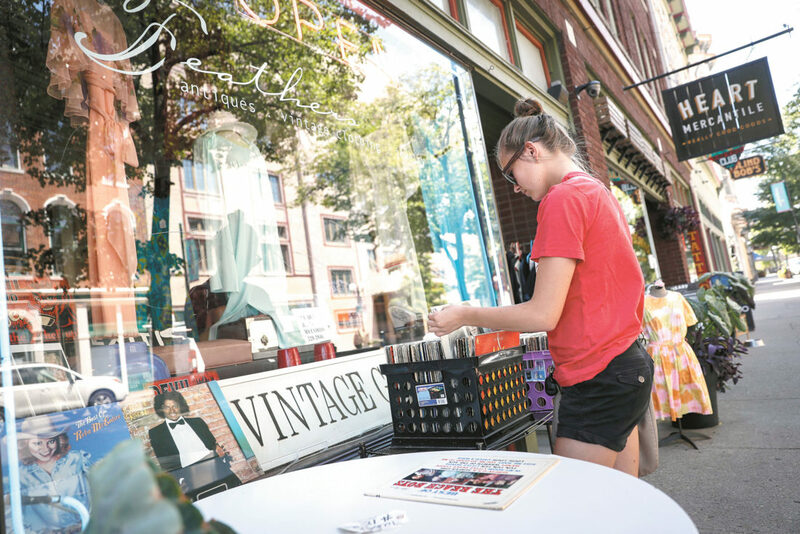 Dayton resident Ash Lyn browses records Tuesday outside Feathers antiques and vintage clothing boutique in the Oregon District in Dayton. DAYTON — When I was growing up in greater Dayton in the 1960s and ’70s, the city already had been to the top of prosperity hill and was coasting down the other side. Early 20th century Dayton was a metropolis that hummed with innovation and commerce. Population topped out in 1960 at just over 260,000. After that, the city gradually lost families to the suburbs and others left as manufacturing declined and jobs evaporated. Downtown retail moved out as the population shifted. By the time I left in the early 1980s, Dayton — and downtown especially — was frayed around the edges. Moving back to Ohio after three decades away, I returned to Dayton and found some good stuff. There was a minor-league ballpark downtown, a lovely riverfront park, people out enjoying themselves and a burgeoning craft-beer culture. Craft beer! The place had become kind of cool. 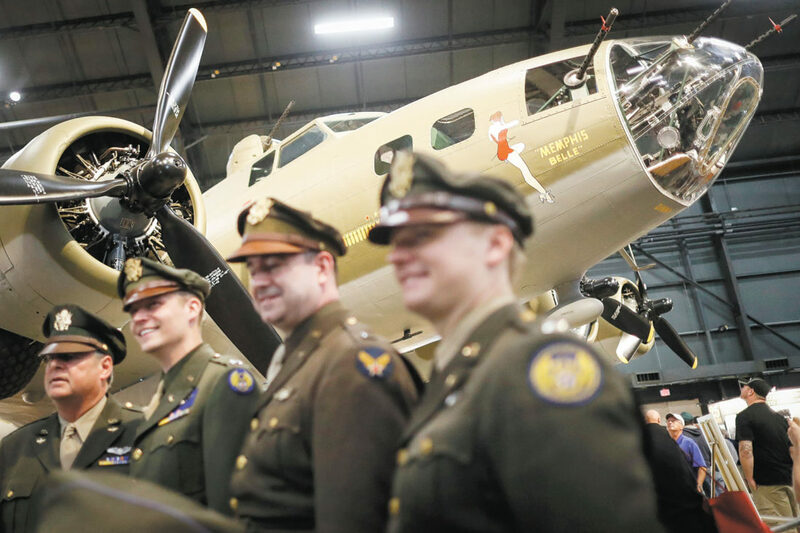 Visitors and period re-enactors gather beside the Memphis Belle, a Boeing B-17 Flying Fortress, on its first day of public exhibition May 17 at the National Museum of the U.S. Air Force at Wright-Patterson Air Force Base near Dayton. Understand, the economy here never again will be what it was when multiple General Motors plants provided thousands of jobs and National Cash Register stood as proud symbol of grand homegrown commerce (the company took its headquarters and 1,250 jobs to Atlanta in 2009). Some parts of the city still reflect the malaise. But efforts to diversify Dayton, trumpet its rich history and make it a cleaner, brighter, more interesting place are working. The city spruced up the Great Miami riverfront, creating a family friendly downtown park. An old railroad freight house was converted into a popular public market. The city scored a minor-league baseball team — the Class-A Dayton Dragons — and put up a fan-friendly, 7,200-seat stadium. Fifth Third Field has sold out every single game since it opened in 2000 — the longest streak in any professional sport. The ballpark draws crowds even though the Cincinnati Reds, a Major League Baseball team, play just 55 miles away. “Certainly this side of downtown wasn’t doing really well, and that started to change around the time of the ballpark opening,” said Alan F. Pippenger, whose venerable family business, the Requarth Lumber Co., is situated just beyond the left-field foul pole of Fifth Third Field. 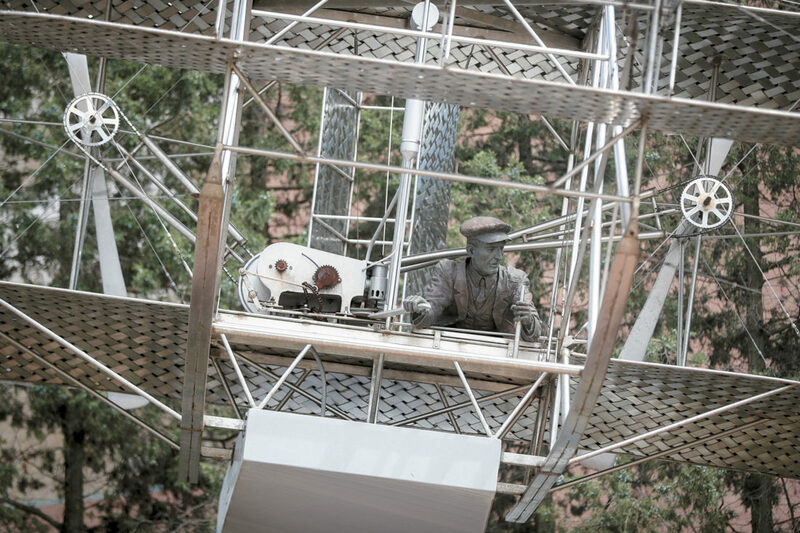 The Requarth building has been there so long that the Wright Brothers visited to buy lumber for their early flying machines. 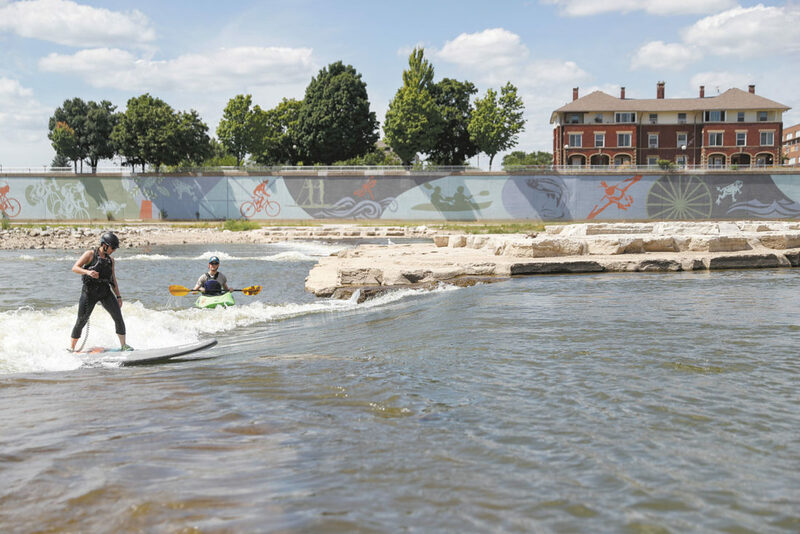 Enthusiasts practice on their watercraft at the RiverScape Metropark, Tuesday in Dayton. When Pippenger came back to Dayton to take over the company in 1985, one of the only places to get lunch was the basement snack bar of the Sear’s store down the street. There are way more choices now. And more people around. New restaurants and bars have opened up around the ballpark. Closed factories and warehouses have been converted to sleek apartments that are snapped up as fast they’re built. Construction equipment downtown has become a familiar sight. Dayton also boasts a resident philharmonic orchestra, 2,300-seat downtown performing arts center and a nationally recognized art museum. Not bad for metro area with just around 800,000 people, including 140,000 in the city itself. 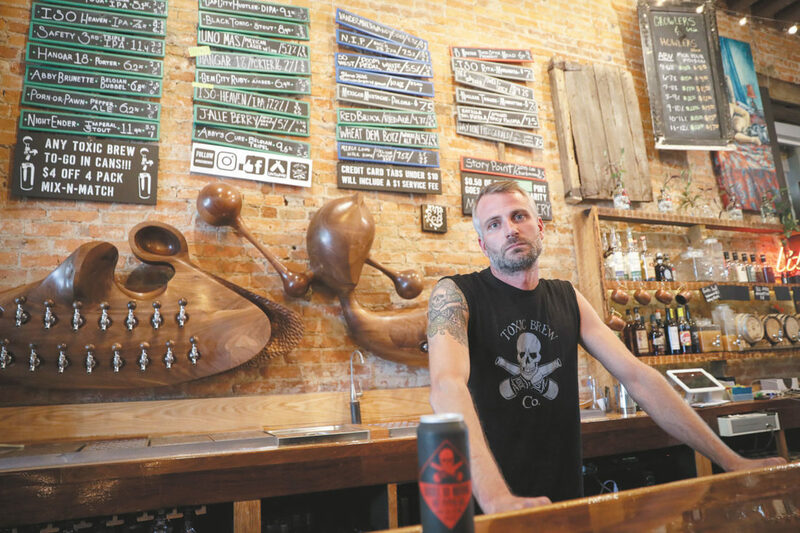 Shane Juhl, owner of Toxic Brew Co., poses Tuesday in his taproom in the Oregon District in Dayton. The center of residential life in Dayton’s formative years, the historic Oregon District has some lovingly preserved buildings and homes. Fifth Street now is a hipster haven, lined with bars and restaurants and a great place to see live music. A tribute statue commemorating the Wright Brothers stands on Monument Avenue in Dayton. Craft beer has become the next big thing, with at least a half-dozen bars/restaurants and four breweries opening within a mile of each other near Fifth Third Field, part of the Dayton Ale Trail. Besides sublime local brews, many of the places have excellent eats. March Madness begins every year with great fanfare in Dayton. First Four play-in games of the NCAA Tournament have brought the national spotlight to the city for the past 18 years. The event is well-supported locally as eight potential Cinderellas play at University of Dayton Arena for the chance to break into the big dance. The second night of this year’s First Four set a new attendance record for the event.